Hortus Camdenensis | Corynocarpus laevigata Forsk. Frost tender, erect and bushy, then spreading tree with elliptic, deep green leaves, and, when mature, stiff panicles of tiny, greenish yellow flowers in spring and summer, followed by orange fruit, to 4cm long. To 15m. [RHSE, Hortus]. ‘A native of New Zealand, drawn from a specimen sent by the late Mrs. Sherbourne, from her collection at Hurst House, Lancashire, and the only one we have seen; so that in the absence of fruit, we can only speak, as Mr. Allan Cunningham and others have done, doubtfully, as to its place in the Natural System. The position of the seed alone would militate against its being one of the Myrsinaceae, and there is a something in the structure of its flowers indicating an affinity very different from that family. 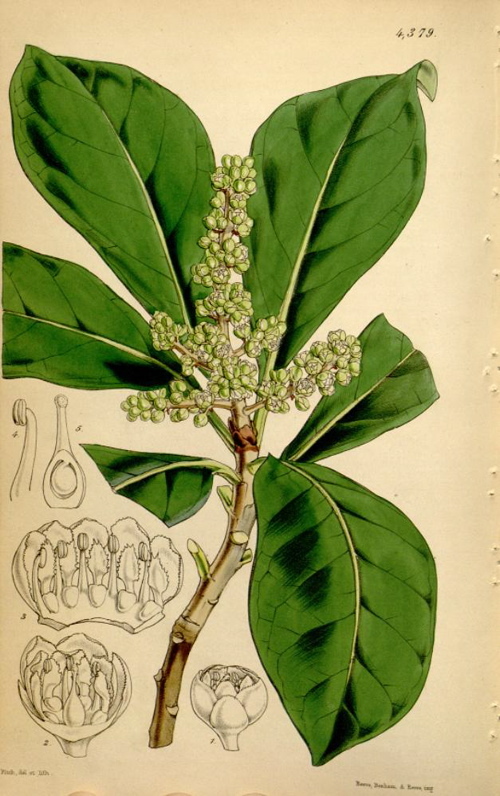 Although the blossoms have little to recommend them, the plant itself "forms a tree," says Mr. Cunningham, "Karaka of the natives, upon which the eye of the traveller rests with pleasure, by reason of its rich dark glossy leaves and highly ornamental growth; and it furnishes a plum-like fruit, of which the drupaceous coat, when fully ripe of a sweetish taste, is eaten by the natives. The nut or kernel also, upon being deprived (by steaming and maceration in salt water) of the poisonous property it is said to possess, is held in considerable estimation by the New Zealanders, who collect and use it for food, in seasons of dearth. If eaten without this necessary preparation, the person becomes seized with severe spasmodic pains and convulsions; from which the sufferer, in some cases, does not recover, but has been observed to die in great agony in a few hours. The timber is not used for any other purpose than as fire-wood, being of short fibre and very soft." It is a green-house plant, and flowers in May.’ Introduced to Europe in 1823, it was first flowered in England in 1846 at Hurst House. [BM t.4379/1848]. Listed in all published catalogues [T.347/1843]. Possibly obtained from John Bidwill.